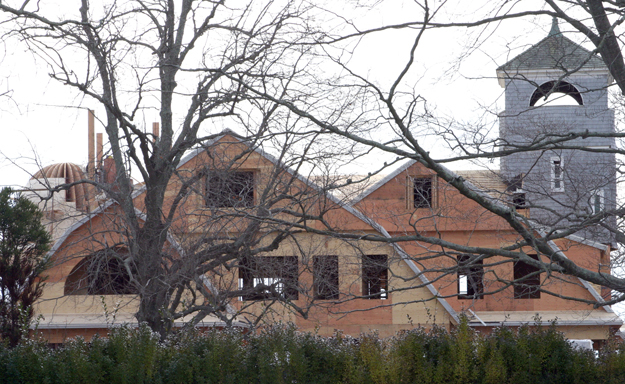 PETER BOODY PHOTO | A new house takes shape on site of the century-old Artemas Ward home. Richard Hogan’s new house is taking shape on the shoreline in Shorewood, incorporating the watchtower of the original shingle-style house on the site built by advertising and marketing entrepreneur Artemas Ward a century ago. Ward (1848-1925) was one of the founders of modern advertising as well as an author and a publisher. Compromised by extensive rot, it was demolished in 2009. Mr. Hogan’s American Direct LLC won a special exception permit from the Town Board to build a house larger than 6,000 square feet last June. It will have a total of 7,524 square feet of habitable living area , slightly less than the Ward house because it will not have bedrooms on the third floor.